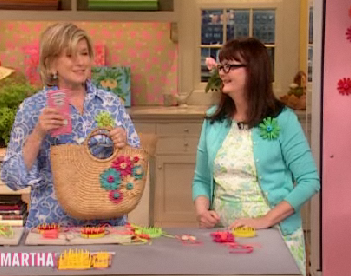 Cathy Callahan may be the one crafter I know who appreciates kitschy vintage crafts as much as I do. As if I didn’t love her enough with her amazing flower loom kits on Etsy and the plethora of vintage craft book goodness on her blog Cathy of California – she goes off and writes my new favorite craft book. 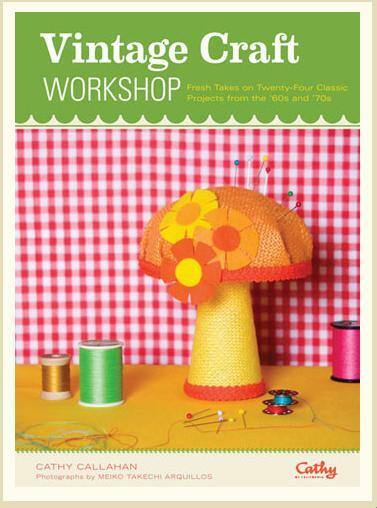 If you too have a penchant for vintage crafts you are going to want to get your hot little hands on a copy of Vintage Craft Workshop: Fresh Takes on Twenty-Four Classic Projects from the ’60s and ’70s stat! 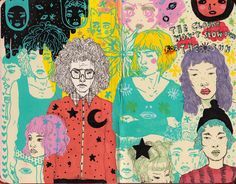 I have a vast collection of vintage craft books that I pride myself on, apparently so does Cathy Callahan. If we got together with our stash and a cup of Sanka or a can of tab we could chat & craft it up for hours. We couldn’t do it in person so instead we had a chat over email which I thought I would share. 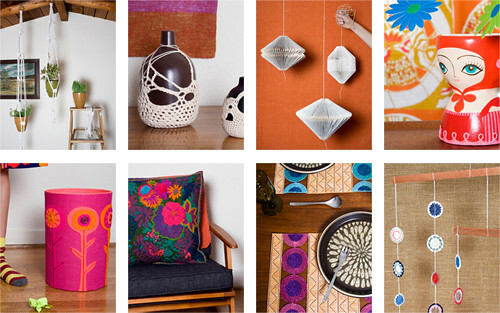 When I think of designers taking vintage crafts and re-working them you are always the first person that comes to mind. Your gorgeous loom flowers, perky mushroom pincushions & constant treasure trove of vintage craft book images on your blog. When did your love of vintage crafts begin? Why thank you Jennifer! You will be able to read the whole story in my book but basically a few years ago (while I was preparing for my first craft fair) one thing lead to another and I discovered that the crafts I was making were very much like the ones my mom made in the 60s-70s. A friend mentioned that the stuff I was making reminded her of the crafts her family made from a particular line of kits when she was little. An eBay search lead me to a few of the how to books from the same company that made those kits. I bought one of the books and I discovered that the crafts featured in those books were just like the ones my mom made when I was little. I then set out on collecting craft books of the 60s and 70s both for inspiration and as a way to honor my mom. Choosing which vintage crafts to make for Vintage Craft Workshop must have been like Sophie’s Choice. There are so many out there. How did you decide which to use in your book? Are there any projects that broke your heart not to include and we can expect to see in Vintage Craft Workshop Part 2? The process of choosing which crafts to use in my book was both really fun and somewhat daunting all at the same time! Fun because I love looking thru vintage craft books and daunting because there was just so much to choose from. I tried my best to match projects up with each contributors special talents and love for a particular type of craft. Take Diane Gilleland’s plastic canvas place mat project for example. It’s Diane’s mission to make plastic canvas cool so she was the perfect person to do a project inspired by “Serendipity in Hi-Straw” (plastic canvas projects made using raffia). Oh yes I would love to do a part 2! Truthfully I probably have enough ideas for a whole series. I love the segments in the book about various pioneering crafty ladies. Two of my faves: Aleene Jackson and Enid Collins are profiled. I’m a collector of Enid Collins bags, I have a gut feeling you too have a stash. Am I right? 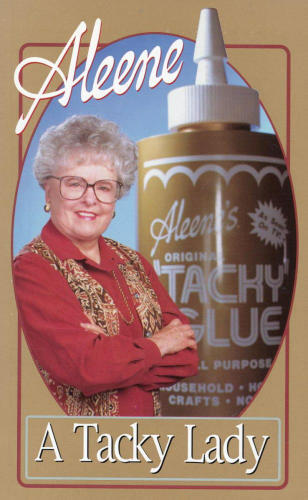 Also is it just me or does it seem like Aleene and her Tacky glue invented every vintage craft ever? I once posted a picture on my blog of a Christmas tree covered in giant ice cream cones and Aleene’s daughter Tiffany Windsor emailed saying that was her. How did you decide which people to profile? Why yes I do happen to have a few Enid bags and some of her jewelry. Working on the profiles was so much fun. Many of the women who started craft companies in the 50s and 60s have some pretty amazing stories – especially Enid and Aleene. The profiles really just grew from my research and they all ended up being extensions of the projects. Take for example my Flower Waste Paper Basket project. It was inspired by something my mom used to make as well as a photo found in a Hazel Pearson book. So naturally I had to profile Hazel. Also I am curious by nature and had always wondered if there was actually an Aleene. My mom used Tacky Glue in her crafts so I more or less grew up with it. A few years ago I discovered that Aleene was an actual person (as opposed to a Betty Crocker-like invented persona) and of course had to find out more about her. The Vintage Craft Workshop has several contributing crafters reinterpreting classic crafts. How did you decide who would do what? 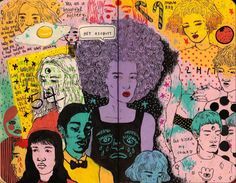 Did you know Susan Beal had a love of mushrooms or that Nicole Vasbinder made a mean bulletin board? I reached out to my friends and crafters whose work I admired. I had a pretty good idea what everyone enjoyed doing and what their areas of expertise were so it was easy to match people with projects. But some delightful and unexpected things also happened. I had the tissue paper tray project in mind for my friend Tom Early – who is a painter. 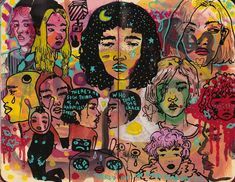 When I went to meet with him about doing a project he showed me some new things he had been working on – tissue paper collages. It just worked out perfectly! Another cool thing happened when I was researching Enid Collins. I contacted her granddaughter to get some information. It turned out she was a crafter (who is very influenced by her grandmother) so it was just all to perfect that she do a project for the book. I adore all the images in The Vintage Craft Workshop. The set ups and backdrops reflect the vintage feel of the book in a hip modern way. Inquiring minds want to know: are any of the goodies in the pictures from your own home or did you help style the photo shoot? Chronicle always makes the most wonderful books, yours is no exception. I was beyond thrilled when Chronicle hired Meiko Takeshi Arquillos to photograph my book. I had long admired her photographs in many of Lotta Jansdotter’s books. We hit it off right away. Her style and sensibility were just perfect for my book. Yes many of the props are my stuff. I basically loaded up about half of my home in my car and took it over to her studio. And yes some of the shots were done at my house. I love everything that Chronicle does and it was so nice to work with them. Along with photos of the original projects & the crafty ladies profiled there is quite a bit of craft history included in The Vintage Craft Workshop. I love that not only are the readers learning a craft, they are learning about the history of craft. Was doing your homework for the book hard? Did you have a difficult time finding the information and crafts? I was so happy that my publisher liked my idea of giving a little bit of history to go along with the projects. I felt it was important for readers who might not be familiar with what was going on in the 60s – 70s to have a little background. That way they could be inspired even more. The homework was not hard at all – I just turned to my collection of vintage books and magazines. I also reached out to some of ladies (and in some cases their families) who I profiled and got a lot of information from them. Tiffany Windsor (Aleene’s daughter) was super helpful. One bittersweet note is that Jean Ray Laury just passed away. I did a couple of phone interviews with her last year and she was just the sweetest lady. She was still working on book proposals and her quilting. I was so looking forward to sending her a copy of the book. 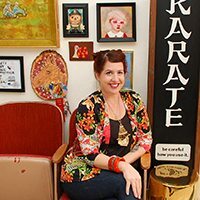 For people interested in expanding their own vintage craft workshop where do you suggest they go to find more information? Do you have any favorite websites, books, Etsy stores ect for vintage supplies, books or information? 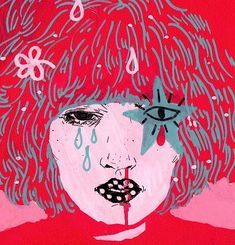 Ebay is by far the best place to find vintage craft supplies, fabric, books and magazines. It also serves as an amazing research tool. Figure out what you are looking for, sign yourself up for “saved searches” and your email in box will be filled with great finds everyday! What is your most prized vintage craft treasure? Do you have any supplies that you just can’t bring yourself to use because you have not found the perfect project? I have tons of vintage jewelry supplies, kitschy wrapping paper and cupcake toppers that I can not seem to bring myself to part with. No craft project ever seems worthy. Yes I am a border line craft supply hoarder. My most prized craft supplies are my mom’s fabric scraps. I made a mini quilt using some of them last year – just as a way of preserving and documenting them. I also used some of that fabric for the project I did for for Crafting a Meaningful Home by Meg Mateo Ilasco. I got an email a couple of years ago from a guy who said his aunt had worked for Hazel Pearson (who I profile in my book) and that he was having a sale. There were tons of supplies from the 60s still in their original packaging. I bought a big box full of them which I am saving just because I like the packaging so much. What does the future have in store for you? Any new books on the horizon? Has Martha Stewart called and asked you back for a repeat performance? Teaching any classes? For those of us that can not get enough Cathy Callahan tell us where to find you. I will be doing a mini west coast book tour in May. I have just started a little blog devoted to the book where I will be posting all of the latest info. I do have a few book ideas in mind that I have started to develop. Fingers crossed I get to go on Martha again! Like reading interviews with your favorite crafty peeps? I got lot’s more for ya! Posted April 21, 2011 & filed under Books, Crafty, I Love to Create, Interviews. What a great interview! I adore Cathy and her new book – thanks for this great post. Loved this!!! Someone new and wonderful to read!!! I have a few Enid bags too…but I never knew she did jewelry!! !